WHAT ARE THE BEST ONLINE BACHELOR'S IN WEB DEVELOPMENT? What Can I Expect from an Online Bachelor's in Web Development Program? What Can I Do With a Bachelor's in Web Development Degree? From structure to content, and visuals to security, web developers are essential to each layer of the most innovative web pages and software applications emerging in today's market. Trained web developers work with graphic designers, software developers, mobile application engineers, and content creators to generate functional web sites across a variety of industries. 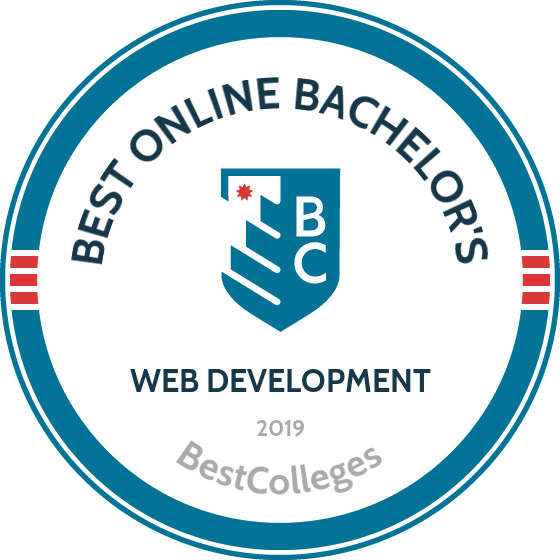 Whether you're a beginner looking to enter the industry, or a mid-career professional wanting to develop complementary skills, now is the time to begin an online bachelor's in web development. Web design and development is one of the fastest growing career fields in the country. According to the Bureau of Labor Statistics, job prospects for trained developers are expected to grow by 27% from 2014 to 2024. Given these accelerating opportunities, an online degree in web development will boost your earning potential and provide the competitive edge you need to advance in your career. Employers hire candidates with fresh perspectives and technical skills to complete a job. An online program in web development introduces you to the newest concepts, technologies, and theories of web design, and provides an environment to practice your developer skills. A bachelor's degree will provide a foundation for career advancement and greater earning power. The best online bachelor's in web development programs provide the foundation students need to begin this career. Most schools require a high school diploma or equivalent degree for acceptance, and no prior work experience is required. Many programs encourage students to seek out internships and create capstone projects to build their resume during the program. This is a personal decision, and the right program will develop your passion into a lifelong career. Look for a program that aligns with the specific skills you want to develop. For example, some degrees offer focused training in mobile application development, while others offer concentrated study in information security or networking. Look for clues within the course catalogue and request more information from the school to find the right program to suit your interests. CAN I WORK WHILE I COMPLETE MY ONLINE BACHELOR'S IN WEB DEVELOPMENT? One benefit to completing an online web development degree is the flexibility to schedule coursework around your life. The ease of online learning allows you to work even while earning a degree. Online programs support the busiest lifestyles, and allow you to complete assignments, take exams, and communicate with professors on your own timeline. If you are planning to work full-time and study, contact your professors when coordinating internships in your program. Established in 1888, Brigham Young University-Idaho is a private university affiliated with The Church of Jesus Christ of Latter-Day Saints. The school enrolls over 11,000 distance students through 18 programs, including a web design and development online degree. Students can complete the entire BS in web design and development online. They take 40 credits in foundations courses, 54 credits from major-specific classes, and 26 elective credits for a total of 120 credits. During their final year of study, learners work with a faculty adviser, professional mentor, and/or classmates to construct a capstone project that integrates everything they learned throughout the program. Additionally, web design and development students can earn three credits through a semester-long internship. Applicants to BYU-Idaho's online programs must complete PathwayConnect, a one-year program that prepares students for college-level coursework. Alternatively, students can apply to the online program after completing at least 15 credits through BYU, BYU-Idaho, BYU-Hawaii, or LDS Business College. PathwayConnect students must hold at least a 3.0 GPA, while other applicants need a 2.0 GPA or above. Based in Lynchburg, Virginia, Liberty University is a private, evangelical Christian institution offering more than 600 academic programs. Liberty students can choose from over 250 online options, including a BS in information technology with a concentration in web and mobile programming. The information technology bachelor's program requires 120 credits. Students take 39-42 credits of general education courses that cover areas like communication, information literacy, math, and natural science. Additionally, Liberty requires three courses in Christian life and thought. These foundational religion courses discuss the Old and New Testaments, Christian life, and basic theology. Learners also complete 57 credits of major courses. Through core information technology classes, students explore topics including information systems hardware, human-computer interaction, and advanced object-oriented programming. Web development courses cover client-side programming, server-side programming, and mobile programming. Aside from core and general education courses, students may take 12-21 credits of free electives. Students take courses fully online through eight-week sessions. They study asynchronously while meeting regular deadlines for assignments. On average, BS in information technology students earn their degree in 3.5 years. Applicants need at least a 2.0 GPA for full admission; Liberty accepts students with lower GPAs conditionally. All prospective students must submit proof of English proficiency. Liberty allows transfer students to apply up to 90 credits of previous coursework toward a bachelor's degree. Applicants interested in information technology can also pursue concentrations in data networking and security, application and database development, and gaming design. Established in 1966, Bellevue University is a nonprofit institution based just outside of Omaha, Nebraska. BU's nearly 9,000 students can choose from over 80 programs, including one of the best online web development degrees. BU delivers the online web development degree using a cohort model. Students take courses asynchronously alongside a group. They use an online platform to submit assignments, attend classes, and participate in discussions. BU's online learning platform also enables students to conduct library research and receive writing assistance. The Tutoring and Study Skills Center offers free peer tutoring to help distance students succeed academically. Transfer students must submit official transcripts from all postsecondary institutions they attended. Additionally, transfer students need at least a C- in any course that they wish to transfer toward a BU degree. They must complete at least 30 credits at BU to graduate. Founded in 1932, Southern New Hampshire University is a private institution that serves over 90,000 online students. SNHU boasts more than 200 online academic programs, including a BS in information technologies with a concentration in web design and development. Web design and development students complete 120 credits to earn the bachelor's degree, including 42 credits of general education courses. As part of their general education coursework, information technology students must take microeconomics, introduction to quantitative analysis, and applied statistics. Students also take 57 credits of major courses, covering topics like scripting, computer platform technologies, and cyberlaw and ethics. The program also stresses non-technical skills and all information technology students take classes in project management, information technology communication, and human relations. Students concentrating on web design and development cearn 12 credits from four specialization courses that focus on topics including user experience, mobile application design, and software development. Online learners take courses in a self-paced format through eight-week sessions. They benefit from many online resources, including a writing center, an online library, around-the-clock tutoring services, career services, and academic advising. Transfer students can apply up to 90 credits toward the web design and development program. Students with information technology certifications from organizations like Cisco, CompTIA, or Oracle may qualify for credits toward their bachelor's degree. Founded in 1884, Northwestern State University of Louisiana is a public institution based in Natchitoches. The school boasts 40 online programs at the associate, bachelor's, master's, doctoral, and certificate levels. The online BS in computer information systems with a web development concentration requires 120 credits. Learners take 42 credits of major courses on topics like secure programming, mobile applications development, and network design and hardware. NSU requires students to take 10 core business courses that discuss areas like finance, cyber business law, and marketing. During the fall and spring terms, students take courses in eight-week sessions. During the summer, NSU offers classes in four-week and eight-week sessions. While students complete all coursework online, some classes require proctored, in-person exams. Learners may take exams at local universities, colleges, libraries, or testing centers. Applicants need at least a 2.0 GPA from core high school classes in English, math, science, social studies, foreign languages, and arts. They also must submit standardized test scores from the ACT or SAT. NSU waives the minimum ACT score requirement for students with a minimum 2.35 GPA. Online students pay the same tuition regardless of residency. Transfer applicants need an associate degree or 18 postsecondary credits with a 2.0 GPA. They also need a college-level math course and a college-level English course. NSU participates in the Louisiana Transfer Degree Program, allowing applicants to easily transfer credits from an associate degree to an NSU online program. Arizona State University, established in 1885, is a public research university that educates over 100,000 students online and through five campus locations. ASU Online offers one of the best online web development degrees. ASU Online constructed the bachelor of applied science (BAS) in internet and web development for students with an associate degree, requiring only 60 credits instead of the typical 120. Students begin the program with 19 credits of general studies courses that cover areas like social sciences, humanities, arts, and design. They also take 15 credits of BAS core classes that discuss topics such as computer systems technology and enterprise planning. BAS in internet and web development students complete 21 credits of major courses. Through a class on graphic industry business practices, learners explore business models, cost analysis, marketing approaches, and management strategies. Another course, digital workflow in graphic industries, covers production systems, job tracking, and other important industry practices. Students work with their adviser to choose five elective credits. At the end of the program, students complete a senior project that allows them to hone their research, communication, and critical thinking skills. The senior project also provides an opportunity for students to demonstrate technical mastery in their concentration. Arizona residents with an associate degree from a regionally accredited school need at least a 2.0 GPA for admission, while nonresidents need a minimum 2.5 GPA. Students may transfer credits from any courses completed with a grade of C- or above. Based in Hays, Kansas, Fort Hays State University is a public school in operation since 1902. The university boasts 31 academic departments that offer hundreds of undergraduate and graduate options. FHSU's Virtual College offers nearly 200 online programs at the undergraduate, graduate, and certificate levels. The online bachelor's in information networking and telecommunications features a concentration in web and mobile application development. Students complete 124 credits through general education classes, core requirements, web development concentration courses, and electives. Through information networking and telecommunications core courses, students explore the basics of informatics, information networking policy, and web development. They also learn about research methods along with entrepreneurial leadership strategies. Five concentration courses examine topics including cyberspace law, front-end and back-end development, and human-computer interaction. Students can select an additional emphasis through 15 credits of free electives. Learners must take a media studies elective that discusses electronic media, video production, or audio production. Incoming freshmen must complete the Kansas Qualified Admissions Pre-College Curriculum with at least a 2.0 GPA. Students qualify for admission with a 21 on the ACT, 1080 on the SAT, or a rank in the top third of their high school class. Transfer students with more than 24 credits need at least a 2.0 GPA on all college work and do not need to satisfy the other freshman admission requirements. Established in 1878, Champlain College is a private institution based in Burlington, Vermont. Distance learners can choose from 15 online undergraduate degrees along with 25 online undergraduate certificates. Champlain's online BS in web design and development comprises 120 credits. Champlain requires 54 credits of general education courses that explore topics such as statistics, ethics, psychology, and economics. Students complete the remainder of their credits through major courses. Champlain offers many typical web design and development courses that cover topics like networking, server-side scripting, and operating systems. In addition, the program boasts unique classes dealing with ethical hacking, retail internet business, and internet business relationships. The curriculum leaves room for two technical electives that lead to a certificate in web design or web programming. Students earn the entire web design and development degree online through asynchronous courses. Learners take most classes during two seven-week terms each semester, but some courses run 15 weeks. The program features six start dates per year, and students who transfer in the maximum amount of credits can finish in one year. Prospective students need a 2.5 GPA, though Champlain considers students with lower grades on a case-by-case basis. Along with transcripts, applicants submit a resume, proof of English proficiency, and answers to 3-4 essay questions. Transfer students can apply up to 90 credits toward their degree from prior postsecondary coursework, work experience, and professional training. The University of Maryland University College was established in 1947 to educate service members and working professionals. Today, the school offers around 100 online programs at the undergraduate and graduate levels. UMUC offers an online bachelor's in digital media and web technology that examines the entire web design process from planning to publishing. Over the course of the 120-credit program, students learn to design digital media, manage projects, and implement web applications. They also master popular industry tools, including Adobe InDesign, Photoshop, Illustrator, Flash, and After Effects. One core major course, introduction to interactive design, explores the principles and techniques programmers use to create interactive digital products. The course covers scripting for the web and mobile devices. After completing all other required courses, students enroll in a capstone class on current trends and projects in digital media and web technology. Through the course, learners study trends, technologies, and theories in digital media at an advanced level. UMUC boasts an open enrollment policy; any applicant with a high school diploma or GED qualifies for admission. The digital media and web technology bachelor's program accepts up to 90 transfer credits. Based in Columbus, Ohio, Franklin University is a private institution that caters to working professionals. The school operates dozens of campus locations and boasts extensive online offerings. Nearly 80% of Franklin's students take classes online. The university's online BS in web development consists of 124 credits. Students take 38 credits of general education courses that discuss topics like research writing, statistics, interpersonal communication, and social sciences. Through 25 credits of professional core courses, students explore the basics of computing. A class on computer networks introduces concepts such as network infrastructure, architecture, and protocols. A programming class teaches students about structured programming, data types, and algorithm design. At the end of the program, students demonstrate their knowledge and skills through a capstone course. They work independently and in groups to create and maintain web-based services. Students must display competence in server-side programming, client-side programming, user experience, and operational performance to graduate. Franklin lets students transfer in up to 94 credits from another college. Over 90% of Franklin's students transfer some credits toward their degree. Davenport University is a private institution based in Darren, Michigan. The school serves nearly 7,000 students through over 50 programs in business, technology, healthcare, arts and sciences, and urban education. DU's Global Campus boasts more than 20 online undergraduate options, including one of the best web development degree programs online. DU's BS in computer information systems features four specializations: web and mobile development, programming, database and analytics, and secure software development. Web development students learn to create interactive web content for businesses. Students specializing in programming explore operating systems, architectures, and systems integration. Regardless of their specialization, students take 27-28 credits of general education courses that include classes on globalization, diversity, and presentation techniques. Additionally, all computer information systems learners complete three foundational business courses in professional ethics, management, and accounting. Computer information systems core classes discuss topics like project management, programming, data analytics, and web page applications. A course in requirements planning and development explores the five phases of the systems development lifecycle. In the class, learners study how technology professionals plan, design, and implement business systems. DU students complete the bachelor's degree through asynchronous online classes. While some courses may require synchronous sessions, most do not include any specific meeting times. Students use Blackboard to submit assignments, take quizzes, and participate in discussions. Incoming students can transfer up to 90 credits toward the bachelor's program. Based in Winfield, Kansas, Southwestern College is a private institution affiliated with the United Methodist Church. The small college enrolls under 2,000 students and boasts a student-to-faculty ratio of 11-to-1. Learners can select from 57 undergraduate majors, including an online BS in computer programming. The bachelor's degree in programming prepares graduates for careers in database management and computer programming. The program equips students with skills across several industry-standard programming languages and data organization tools. Learners also build abilities in debugging, deductive reasoning, leadership, and database design. The program comprises 124 credits from general education and core courses. Students complete the degree entirely online through six-week online classes. General education courses cover topics like professional communication, composition, and ethics. A course in information literacy teaches students to locate information sources, assess the credibility of internet information, and give presentations. Applicants need at least six postsecondary credits and a 2.0 GPA to qualify. Incoming students can transfer in up to 64 credits from a regionally accredited institution. Additionally, students can receive transfer credit for military service and work experience. Southwestern requires students to complete at least 30 credits in residence to earn a degree. Founded in 1965, the University of Maine at Augusta is a state university that offers 20 bachelor's programs. UMA serves students at several campus locations and online. The school boasts 12 online bachelor's degrees, including a BS in computer information systems. Graduates of UMA's computer information systems program work as programmers, information system developers, information technology managers, and network administrators. Web development students learn to design, manage, and analyze business systems. They also study the basics of database maintenance, information systems security, and software development. Students graduate with competencies in project management, basic accounting, and organizational theory. Learners must complete at least 121 credits with a 2.0 GPA to earn the bachelor's degree in computer information systems. Students take 31 credits of general education coursework, including at least one writing-intensive course. They satisfy the bulk of credit requirements (87 credits) through major courses. Core major classes include programming fundamentals, elementary statistics, and networking concepts. UMA accepts new students on a rolling basis. Applicants must submit high school transcripts, a GED certificate, or postsecondary transcripts. Students may earn transfer credit from courses with a C- or better. Based in Flint, Michigan, Baker College is a private institution with several campuses across the state. The school serves students through eight colleges, including the College of Engineering and Information, which offers an online BS in information systems with a concentration in web development. Baker's information systems program equips students with general business and management skills along with technical computing knowledge. Through a 120-credit curriculum, students explore topics like programming, database management, project management, networking, and information security. They also learn to use technical skills to solve business problems, contribute to company management, increase profits, and improve productivity. Learners complete 75 credits in the major along with 18 credits of web development concentration courses. Web development students take classes that discuss introductory HTML, interactive web design, and web scripting. Students earn the online information systems degree asynchronously. Courses feature set start and end dates, but students can complete coursework at their own pace. Online learners can take advantage of Baker's online library and many other resources, such as the Virtual Academic Resource Center that offers one-on-one tutoring. Applicants must demonstrate adequate academic skills through high school transcripts, ACT SAT, or GED scores, or prior college-level work in math or English. Transfer students can apply individual credits or an entire associate degree toward bachelor's requirements. Baker maintains transfer agreements with many higher education institutions in Michigan. A program's structure and graduation requirements vary depending on a school's focus and faculty strengths. The best online bachelor's in web development emphasizes analytical thinking, strategic planning and the discipline to complete projects over time, all while learning the skills to design and maintain dynamic websites. Depending on your specialization, an online bachelor's degree curriculum will include theoretical and technical courses required for web development. In addition to general education courses, your degree will include some of the classes below. Intro to Human-Computer Interaction: This course examines the ways people experience technology via an overview of the concepts, theory, and practice of human-computer interactions. Cognitive and social theories of human interaction are explored alongside a study of interactive software and device development. Internet applications, social networking, cloud computing, and mobile applications are reviewed as specific platforms for user engagement. Web and Mobile Programming: While Internet technologies shift dynamically, this course focuses on technologies used for enterprise-level communication, including business-to-business services and client-server applications. Students review modern and emerging technologies and learn ways to adapt technologies as industry and client needs grow. Introduction to Digital Media: This course provides an intensive introduction to the fundamentals of digital media in web technology, digital design, and animated graphics. Students review techniques, principles, and theories that guide web design and development. Topics include usability, accessibility, and ethics of design and use. Students also review the digital media industry with particular focus on potential career paths. Information Security: This course introduces basic concepts of cyber security and information assurance. Students review security policies and models for secrecy, integrity, and availability of information. Topics include cryptography, vulnerability, and web services for information security. Coursework prepares students to effectively archive, recover, and prevent the loss of information. HOW LONG DOES IT TAKE TO GET AN ONLINE BACHELOR'S IN WEB DEVELOPMENT? Most online bachelor's in web development programs require a total of 120 credit hours, or 30 credits per academic year. Full-time students should expect to complete their degrees -- on average -- in four years, depending how many credits are taken each term. A few programs offer degrees for learners already holding an associate degree or prior coursework. If you have previously completed coursework, check with your prospective school to learn whether your credits are transferrable to your new degree. Prospective students should also review course schedules and assess the compatibility with their schedule and learning needs. Many programs offer asynchronous courses, in which coursework can be completed as your schedule allows. Individual pacing for some programs lets students accelerate their degree or specialize the focus of their degree. Other schools offer cohort learning, in which students are required to follow a dedicated curriculum path together alongside their peers. There are no field-specific accreditations for online degrees in web development, but it is always best to inspect the accreditation of your prospective school. The United States Department of Education (DOE) creates standards to evaluate and grant accreditation. Throughout the United States, six agencies are responsible for awarding regional accreditation. This accreditation generally guarantees that credits earned can be transferred between schools. Additionally, when learners apply for tuition reimbursement, regional accreditation typically meets minimum requirements. Programs with regional accreditation, however, may be more expensive and require additional classes in the humanities. Accreditation is also granted through national agencies. It is common for schools with national accreditation to provide vocational coursework and certifications in addition to specific degrees. Though nationally accredited schools may be more affordable, review whether credits earned at a nationally accredited program will meet the standards for licensure and transfer. It is advisable to check with your employer to confirm credits at a nationally accredited program qualify for corporate tuition assistance programs. Another accrediting body is the Council for Higher Education Accreditation (CHEA). As a large association of colleges and universities, CHEA provides information on accreditation, maintains quality standards for its members, and advocates for education excellence on behalf of the public to the U.S. government. Please visit the the DOE and CHEA websites for information on accreditation standards and a full list of qualifying schools. Web developers design and maintain websites. They create the visual and interactive elements of websites and are responsible for maintaining a site's capacity, speed, and responsiveness. Common responsibilities include content creation and visual design. Multimedia artists and animators build the visual effects for a range of medias including games, movies, television, and digital interfaces. Blending technical skills with creative expression, multimedia artists contribute to the user experience and aesthetic efficacy of content encountered online. A computer and information systems manager coordinates all computer-related activities within an organization. They assess and enhance technology within a company, such as security, storage, and network capacity. Depending upon their specialization, software developers facilitate computer networks systems, or allow specific applications to facilitate an organization's most critical needs. Coupling creative vision with technical knowledge, software developers support the core applications for computer functionality. Graduates with a degree in web development benefit from salary increases as they accrue more experience. The following table illustrates expected salaries for professionals in the field of web development and design at different stages of their careers. Adobe Certified Expert: As the leading maker of development and design software, Adobe offers certifications in both single products (i.e. Adobe Dreamweaver) or as an Adobe specialist for industry-specific skill sets (i.e. Data Specialist). Certifications are affordable (as little as $180) and are valid for two years. Microsoft Developer Certifications: From the HTML5 App Development Fundamentals Exam to the Microsoft Certified Solutions Developer credentials, certifications offered through Microsoft signal mastery of essential development skills to potential employers. Exams and certifications are often reduced in price for students and are available online. Google Analytics Individual Qualification (IQ): Assessing web content and strategy requires advanced understanding of the latest analytics tools. Google provides free online training resources that certify learners as experts in analytics. Certification is valid for 18 months and recognized widely as the industry standard in the field. Professional organizations can help students learn more about the job market, network with other web developers, and engage with new educational resources to keep their design skills fresh. Below are a few important organizations for students and graduates of online programs in web development. These organizations provide continuing education opportunities, online job boards, and host networking events for prospective students and college graduates entering the field. With over 300,000 members in more than 106 countries worldwide, the International Web Association is the industry's leading professional organization. Dedicated to developing a professional and educational support network for web professionals, IWA hosts online content to deepen web skills, as well as an online job board, and international event information. With a 17 year history of supporting web professionals, the World Organization of Webmasters is an online network of educational resources for developers to hone their skills, connect with other professionals, and learn more about international certifications and specializations to remain marketable within the industry. As the oldest and largest professional organization for design, AIGA believes design across various medias should be advanced as a professional craft. Members collaborate with designers outside their specialty, find job listings, attend workshops and conferences, and contribute to international projects. Each student should investigate internal scholarships, tuition breaks, or funding opportunities each school might offer to assist with financing their online bachelor's degree. Students may be eligible for private grants and scholarships through non-profit organizations, companies, employers, and other sources. Federal financial assistance will also offset costs or provide financing opportunities to prospective students. The Department of Education's Free Application for Federal Student Aid (FAFSA) provides information on grants, scholarships, loans, and work-study options. Completing this application should be the first step in pursuing any financing options.